The /5 BMW is shown as an example, but this info applies to many models. Just behind the BMW motorcycle engine and under the transmission is an area that is sort of a "catch basin" or tray. It is best viewed from the left side of the bike. I have no idea if this "tray" was intentional or not, but we are glad to have it. It is an indicator of a possible problem. It should be clean, but it is the place that will collect oil from an oil leak. When cleaning the bike, spray some degreaser in there and run a bottle brush through it to get it clean. It needs to be clean so that you can tell when a new leak develops. This photo shows a dirty bike that isn't leaking oil. You can see, but not in this first photo, some dirt that has collected in a light film of oil. 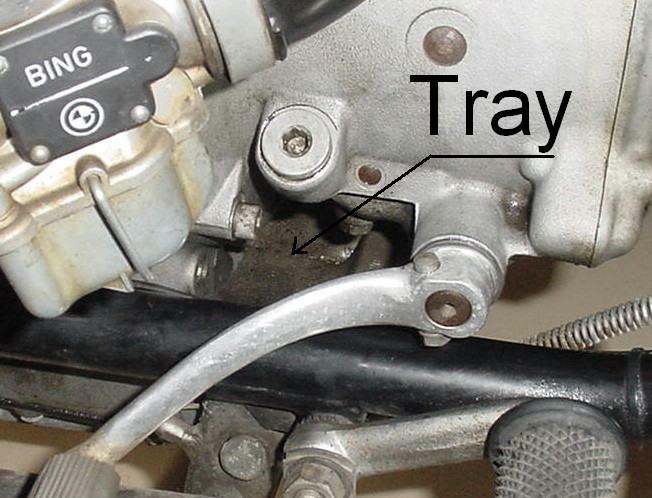 The tray is directly below the transmission filler plug that is in the upper center. That is a common condition, but it isn't a problem. One drop on a hot engine will spread around quite well, collect dust and that is what happened here. I haven't ridden it in two years. A few bikes will be bone dry and while that is great, it is uncommon. Any amount that is in a puddle should get your attention. This photo was taken looking forwards and upwards towards the tray. This hole shows no oil at all and is further evidence that this bike has no oil leakage from this area. If the puddle tries to get really deep, the oil will drain out from this hole at the rear of the tray. The day after a ride, you will see a puddle on the floor, under this hole. The oil can only come from two places, the engine or transmission. Engine oil will have the normal smell and color of engine oil. Transmission oil will smell bad, as it is what is called Hypoid gear oil. If you are not sure, pull the dip stick and smell it, then remove the transmission fill bolt and stick something in there for a sample and smell it. You will detect the difference. A leak from the engine is more of a nuisance than an immediate problem. If the leak is really bad, you must replace the lost oil to keep the engine working. If it is from the transmission, it may indicate a problem that needs attention soon. A transmission leak is coming from the input seal. It may leak because the seal is old or the input bearing is failing. That bearing fails fairly quickly. Replacing bearings isn't cheap, but riding until the gears are ruined too is very expensive. The oil from the transmission input seal can also migrate along the shaft and onto the clutch plate. It can begin the "slip" from oil. It is easy to clean it up again, but requires removal to do it properly. A little oil getting on the clutch plate won't slip, but get all gunked up and refuse to fully release. When that happens the symptom is that it is hard to shift to neutral or first when stopped. That symptom is the same as for a clutch cable with no free play. Get free play at the clutch cable and test it again. When all else fails, remove the transmission and clutch. To fix anything in this area will require that the transmission be removed. This is not a BMW clutch replacement procedure, it can be found elsewhere. While the transmission is out, remove the clutch for inspection and possible replacement. When I have it down to the flywheel I would also remove the flywheel and changing the seal and oil pump cover O ring. That should fix any oil leaking from the engine. It is too much work to get in there and you are 4/5 of the way there, do it. You can also clean it up, as a clean area is easier to diagnose next time. Don't be intimidated by the crank moving thing. It is very easy to prevent. It can be done in several ways. I have used a small block of wood at the front of the crank and put the cover back on and loosely tightened up the cover bolts. 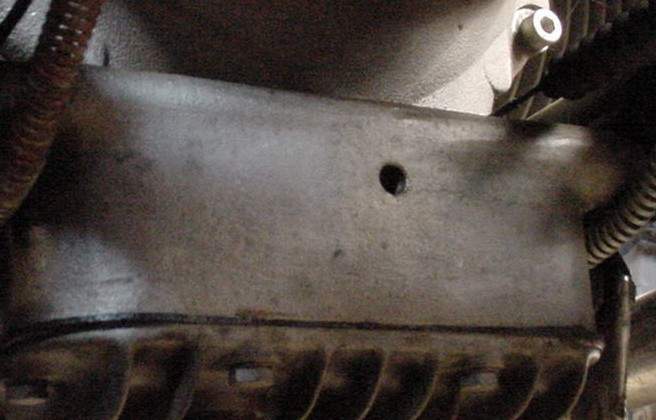 The block was thin enough that the bolts would start and thick enough that they wouldn't bottom out. That way one knows that the cover is pressing on the crank. In the shop we had a jig (probably some BMW special tool that was inferior and over priced too) that fastened on the front and held it back. Remember that it isn't getting any great force trying to push it forwards. Only whatever force you put on it. When a clutch plate wears, it gets tapered. The outer edge is thinner than the inner edge. A new one is about .240" thick. I have seen them wear down to .180" thick and that's the end, replace it. The steel plates on either side of the clutch plate also wear and it's the accumulation of wear on these three parts that causes slippage. The diaphragm, or forwards plate, is slightly harder to measure. See my page on clutch service. I have many times put a clutch back together with all used parts that are still within my specs. They were not matched, by that I mean that they had been in different machines and had whatever wear taper they had. They quickly wear in together and work well. Break them in gently. A new clutch should always be broken in gently, even with all new parts. The fact that the crank moving issue isn't mentioned in some "BMW" workshop manual is normal. I have commented many times what crap those manuals are. That includes the BMW factory one too. I would venture to say that every single procedure is written incorrectly, incompletely or fails to describe it in a readable way. The /5 list is the best place to get both good and bad info. You must sort it out. I would be very suspicious of this post too. I hear that the writer hasn't touched a wrench in 25 years, has white hair, is a cross dresser with advanced dementia.